Port Chester planning officials have unveiled a proposed overhaul of the village’s zoning code that could dramatically reshape the downtown district. First discussed more than a year ago, the far-reaching changes are laid out in a 330-page draft prepared by a Tennessee-based urban planning firm that has so far cost the village $640,000. In the coming weeks, the plan will be presented to village lawmakers who have the final call on whether to adopt the changes. See news story here. The residents of Port Chester – at least 746 of them – decided the fate of the village on Oct. 10, when they voted in favor of cumulative voting. The total number of votes tallied was only 1,175. My group, Sustainable Port Chester Alliance, was in favor of district voting, but we did not campaign against cumulative voting because had the referendum failed, the village would have been thrown into chaos. See news story here. Port Chester’s decade-long voting-rights battle with the U.S. Justice Department over racial discrimination in local elections may have come to a close Wednesday evening. By a vote of 746 to 429, the village made cumulative voting its permanent electoral system. Port Chester now becomes the only municipality in New York State to permanently use the system, which allows voters to “pool” multiple votes for individual candidates. In Port Chester, an Experiment in Voting Aimed to Combat Discrimination. Did it Work? Democracy in the village of Port Chester is eroding. Voter turnout is low, hovering around 10 percent in recent local elections. More troubling, before 2010, no Hispanic or African American had ever been elected as trustee in a village that is majority nonwhite. See news story here. Sustainable Port Chester Alliance Executive Director Joan Grangenois-Thomas poised herself on the stage at Garcia’s on Westchester Avenue in front of a lively crowd of attentive patrons. More than a hundred people drifted in and out of Garcia’s on Sunday, September 30, for the Vote Port Chester event sponsored by the Alliance and The Capitol Theatre. The Sustainable Port Chester Alliance is comprised of community members, labor unions, religious groups and activist organizations, and is dedicated to civil rights activism in the community. Sustainable Port Chester Alliance is encouraged by the many positive responses and expressions of support for our work from the Port Chester community. However, recent actions and statements of the Board of Trustees (BOT) members are cause for concern. See letter here. To hear it from Port Chester Trustee Gene Ceccarelli, one would think that citizens have no place or voice in the democratic process. Or even worse, that elected officials should not have to hear their words or allow them access. See letter here. PORT CHESTER — The issue of voter discrimination against Hispanic voters has been one Port Chester has been dealing with since one of its residents sued the village in 2001. But on Tuesday, the village’s board of trustees listened to how the issue might be corrected from Dr. Lisa Handley, an expert they hired back in November. See news story here. PORT CHESTER – An expert presented some options Tuesday night for a new voting system in Port Chester following discrimination allegations against Hispanic voters. See news story here. PORT CHESTER – A grassroots group held a rally last night outside Village Hall lobbying for a “fair and transparent process to be put in place as the board begins the work of selecting a new voting method,” according to a release from Sustainable Port Chester. Letter: Make it fair, make it clear, put it in writing! In recent months, many citizens of Port Chester have told the Board of Trustees that we need an inclusive and transparent process for choosing the system by which we will elect Trustees in the 2019 elections and beyond. So far, the response of certain Trustees can be characterized as, “Of course the process will be fair and transparent because that’s the way we conduct business here.” In other words, they have treated the selection of a new election system as if it were similar to any other issue that comes before the BOT. Members and friends of the Sustainable Port Chester Alliance turned out for Monday’s Port Chester Board of Trustees meeting to demand that the process for selecting a new voting method for Village elections be inclusive and transparent. Sustainable Port Chester Alliance, a community coalition of local faith, civic and labor organizations, had previously warned that Starwood would look to sell the site. The group had been pushing Starwood to meet with its leaders to negotiate a community benefits agreement that would have required the company provide 20 percent affordable housing with the project, along with labor guarantees and school funding. In a statement Sept. 22, Alliance spokesperson Joan Grangenois-Thomas said the group hopes to work with the site’s future buyer. “While we won some affordable housing and protections for our schools, we’re still not convinced that the village has done everything in its power to make sure this massive development truly benefits Port Chester’s working families,” Grangenois-Thomas said. “We look forward to meeting with whoever buys the site to discuss the need for more affordable housing, local-hire with a career-path for the construction jobs, and greater protections for downtown small businesses. “ See news story here. Port Chester’s plans to revitalize some 120 acres downtown by partnering with a master developer can be informed by a similar experience in New Rochelle, the only other Sound Shore community to take this route to redevelopment. To work successfully, a master developer needs access to a significant amount of public land and/or vacant properties. See the full letter here. In support of Joan Grangenois-Thomas’ letter from May 24, we must work in coalition to ensure the town receives what it needs and what it deserves. The fact that there are dissenting opinions about candidates going into churches and resident spaces is troubling. Should candidates not reach out to the community they both represent and are a part of? Should candidates not introduce themselves and know the people they will be working for? We’re all wondering about the future of our small village. As an 18-year-old Mexican American, I can tell you it’s a concern of mine to see so many faces that don’t look like mine represent me. Growing up here, I can’t tell you what a difference it has been since I first started school and had to translate almost everything for my mom. See the full letter here. A few weeks ago, Joan Grangenois-Thomas’s analysis of the local (Port Chester) political situation was on point. All politics are local. The noise at the state and national level should not and must not drown out the myriad of issues affecting our village, such as the lack of affordable housing and jobs that pay living wages. As a longtime Port Chester resident, I was born in the United Hospital, attended Horton School, the old Junior High School on Irving Avenue, and graduated Port Chester Senior High School (’66). My family has been here since 1925. See the full letter here. Letter: As goes DC, so goes PC? Port Chester’s two elections this year have followed patterns eerily similar to those of November 2016. As with the national elections, conservative candidates in Port Chester have ridden to victory on a wave of long-simmering anger from voters who felt that elected representatives had not been listening to their concerns. Actually, voters from across the political spectrum have expressed concerns about the direction of our village. But the results of the mayoral and school board elections show that Port Chester’s conservatives have reacted by mobilizing to take back control of local government. Where is the corresponding response from Port Chester’s liberals and progressives? See the full letter here. PORT CHESTER, NY – Building on its successful campaign to extract concessions from Starwood Capital that benefit the community, Sustainable Port Chester Alliance (The Alliance) has no plans to rest now that the Port Chester Board of Trustees has approved the final findings statement and granted the zoning changes requested by the developer. This happened only after some big changes were made from Starwood’s original plans precisely because of the pressure and grassroots campaign by the Alliance. Where the Alliance is buoyed by the inclusion of 36 apartments in the Starwood United Hospital project, we think it’s a stretch to claim them as “affordable workforce” housing. Although the Village staff and consultants called for a deeper level of affordability, the Board decided that the units should be priced for families earning 80% of Area Median Income (AMI) for the County. That equals roughly $78,000 per year for a family of three. Unfortunately, that’s significantly higher than Port Chester’s median family income of about $61,000 — meaning most Port Chester residents won’t be able to afford the “affordable” units. See the full letter here. I have heard all the talk about getting “millennials” to move into the United Hospital redevelopment. I know Starwood even brought down some millennials from Connecticut to a couple of hearings to give the Board of Trustees a sort of “if you build it, we’ll come” pitch. See the full letter here. Residents of Port Chester have worked for much-needed affordable housing for many years. There have been some successes such as Fox Island affordable condos and a 10% set-aside for affordable housing in residential zoning districts. Unfortunately in recent years there have been substantial setbacks. None of the new apartment developments (Mariner, Castle, Lighthouse) have included any affordable units since they are not located in residential zoning districts. Most importantly, Starwood proposes no affordable units for the United Hospital site. In fact, they propose to demolish 134 units of affordable housing at 999 High Street and have evicted all of the tenants. Sustainable Port Chester Alliance (SPCA) has taken up the cause of affordable housing and provided a new force and impetus to promoting the issue and educating the public and the Village Board. Much of the credit for SPCA’s involvement in this important issue goes to the union support (Metallic Lathers & Reinforcing Iron Workers, Local 46; Plumbers & Steamfitters, Local 21; Heat and Frost Insulators, Local 91; Stone Derickmen & Riggers Iron Workers, Local 197; International Brotherhood of Electrical Workers, IBEW Local 3; and Communication Workers of America CWA Local 1103). The support of organized labor for an issue above and beyond its usual focus on apprenticeship programs, employment of local residents, safety in the workplace, and the use of union contractors is laudable. Hopefully the Village Board will listen and vote to require affordable housing and a pre-apprenticeship program on the United Hospital site. Tuesday night marked the last opportunity for residents to publicly express their support or opposition of the conversion of an old hospital site in Port Chester, NY into a luxury building that would include apartments, hotel space and restaurants. See news story HERE. Sustainable Port Chester Alliance will begin holding evening meetings on the first and third Thursday of the month, beginning with Thursday, Feb. 2. The meetings will be held at St. Peter’s Church, located on Westchester Avenue, from 6–7 p.m.
All who are interested to learn more about the work of SPCA and might be interested in helping with their advocacy work are welcome to attend. SPCA is also pleased to announce that they have been awarded a $10,000 grant by the Westchester Community Foundation. This grant will go a long way in supporting the efforts of SPCA to secure a Community Benefits Agreement from Starwood Capital as they move forward with the planned development of the former United Hospital site. For more information, visit www.portchesteralliance.org or call 914-648-2359. Letter: Don’t Support us Just Halfway: Immigrant Justice Includes Housing Justice! As both a Mexican immigrant and a community organizer with the Sustainable Port Chester Alliance, I write to say that racial and immigrant justice includes housing justice. If the United Hospital project does not include real workforce housing—and not just 26 units—many members of the Board of Trustees will have failed the same immigrant families they claim to represent and support. Read more. Zeltzyn Sanchez is a member of Sustainable Port Chester Alliance. Starwood is proposing the largest multi-family development in the Port Chester’s history with no affordable/workforce housing set-aside even though they have forced out all of the tenants in the existing affordable/workforce housing at 999 High St. They plan to tear down the 134-unit building. To make it even worse, even though 27 out of the last 41 remaining families (former United Hospital employees) were able to receive Section 8 Vouchers aided by the interceding of community activists, only four of those 27 families were able to find suitable affordable apartments in zip code 10573. Two other families moved to other zip codes in Westchester. The environmental review process for the redevelopment of the United Hospital should not go forward until Starwood agrees to complete a more thorough study of the project’s potential impacts on downtown small businesses. Thus far, Starwood has taken far too blasé an approach to the effects the project could have on one of our community’s most vital assets. Ten Years is Too Long! More than 10 years ago the Starwood Capital Group purchased the United Hospital property. Since then, Village residents have waited patiently for Starwood to make good on its promise to develop something new for Port Chester. The Sustainable Port Chester Alliance calls on Starwood to sit down, negotiate, and sign a Community Benefits Agreement. At a recent meeting of the Port Chester Board of Trustees, two major issues confronting the village board collided: firefighters and the redevelopment of the former United Hospital site. At a May 2 meeting, trustees voted to eliminate eight paid firefighter positions and transition to an all-volunteer force. The board said the move was necessary and will save the village $800,000. But it has sparked protests in the community both by the professional firefighter unions and residents. 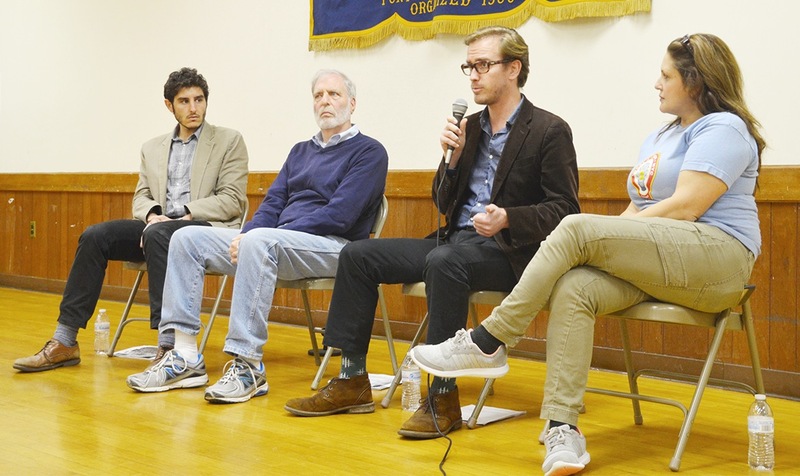 A forum was held at the senior center in Port Chester on Wednesday night. The forum was a continuation of a special public hearing on the redevelopment project at the former United Hospital property off Boston Post Road. Residents voiced their concerns over potential impacts to the community, environment, as well as a proposed zoning change for the property. Port Chester, NY — Three Port Chester Village Trustees, Luis Marino, Greg Adams, and Dan Brakewood, voiced support today for a Community Benefits Agreement (CBA) as part of the redevelopment of the United Hospital Site. On April 11, 2016, a construction worker from Port Chester, working on a job in Darien, fell off a scaffold and died. On April 21, 2016, another construction worker, also from Port Chester, working on a job in NYC, was killed when something fell from above him and struck him on the head. In NYC alone, during the calendar year 2015, there were 17 fatal accidents on construction sites. The workers’ ages ranged from 19-16. All but one were non-union jobs. In the late 19th and early 20th centuries, a massive wave of immigration from Southern and Eastern Europe and Asia combined with limited housing stock to create a severe home overcrowding crisis in New York City. Many among the City’s political classes were unaware of the problem before 1890, when muckraking photojournalist Jacob Riis offered the world a glimpse into the squalid living conditions inside the City’s tenements in his classic exposé, How the Other Half Lives. PORT CHESTER: Protesters in Port Chester say they want guarantees that if there’s not enough money to pay firefighters, there won’t be big tax breaks for corporations who want to build in the area. Port Chester, NY – It felt more like mid-July than late March in the well filled Knights of Columbus Hall on Westchester Avenue in Port Chester Thursday night. Yet cool heads prevailed as five of the eight candidates for the position of Village Trustee answered questions, and explained their positions on issues concerning the proposed Starwood Capital’s development plan at the United Hospital site. So many suburban communities see the same types of blockbuster building proposals: A big-name developer offers to “revitalize” a community or downtown with a mix of retail (chain stories), restaurants (chains) and condos or rentals that will attract millennials (young professionals are not part of chains, but are often spoken of as if they desire the same things and behave the same way). The developer dangles jobs and tax revenue to win permits to build what they want. Local officials, through zoning controls and tax breaks, court development they believe will benefit their municipalities. Often left out of the conversation: the members of the community whose day-to-day lives will be impacted by any development. The eight candidates running for six seats on the Port Chester Board of Trustees in the March 15 election met in the Westmore News offices on the weekend of February 22 and 23 in two groups of four to debate some of the major issues they will be dealing with during the next three years if they are elected or re-elected. Among them are Starwood Capital’s proposal to redevelop the United Hospital site and their plan to rehabilitate or replace the current police station and courthouse. PORT CHESTER, N.Y. — The Sustainable Port Chester Alliance is inviting Port Chester residents — and anyone interested in local development — to attend a Thursday, March 10th forum on the future of the United Hospital redevelopment project. The forum is being organized to help voters know on which side of the issue the trustees and candidates sit. Two Sound Shore communities, seeking to alleviate the sometimes vociferous protest that can arise against development proposals, are mulling a concept that pairs developers with local community groups. Instead of hearing concerns over major development projects aired during the planning process, New Rochelle and Port Chester could soon require developers to address the legally enforceable approval of local advocacy organizations. View: What’s Starwood Really Selling Port Chester? I am writing in response to the recent advertisement released by Starwood Capital regarding the proposed development at the former United Hospital site. Its multi-colored ads highlight the many potential benefits the project will bring to Port Chester. However, I find several inconsistencies with its claims and feel compelled to comment. The Sustainable Port Chester Alliance is a coalition of residents and civic, community and labor organizations created in response to the plans submitted to the Village Board. The $300 million mixed-use development proposed by Starwood Capital Group of Greenwich on the former site of United Hospital is expected to give Port Chester’s economy a boost, and Joan Grangenois-Thomas wants to make sure village residents get their share. PORT CHESTER – Dozens of supporters of Sustainable Port Chester Alliance converged on the mayor and Board of Trustees at the Village Court Building before a recent executive session. Dozens of supporters of Sustainable Port Chester Alliance converged on the Mayor and Trustees at the Village Court Building prior to an executive session. The supporters were there to deliver hundreds of additional postcards signed by village residents urging the elected officials to insist that Starwood work with the Alliance on a plan that better reflects the community’s needs for good jobs, housing and school funding. To date, approximately 500 postcards have been signed and delivered – in both English and Spanish. As Director of the Neighborhood Preservation Company for Human Development Services of Westchester, a not for profit organization administering community revitalization and housing programs in the Village of Port Chester, I am writing to express support for responsible development at the United Hospital site. The Sustainable Port Chester Alliance continues to be clear regarding their expectations of Starwood Capital. If the $45 billion behemoth would like to come to Port Chester to expand their already massive portfolio of real estate holdings, they are going to have to share the wealth with those who make it possible for them to profit. A Community Benefits Agreement is a likely way to achieve that goal, and quickly became the theme of the Town Hall meeting held at the Port Chester Knights of Columbus building on Thursday, October 1. As the Village of Port Chester completes its first round of public hearings for a redevelopment of a long-abandoned hospital, an organization is calling on the village to create affordable housing and permanent jobs at the 15-acre project. A second official opportunity for the public to speak to the Port Chester Board of Trustees on Starwood Capital Partners’ latest mixed use plan for redevelopment of the former United Hospital site under the state’s environmental review process again resulted in a packed courtroom and standing room only on Tuesday, September 8. The Starwood development at the United Hospital site will have great consequences for our village. It depends on what the final agreement is. We the undersigned feel that the final outcome depends on a number of issues. A Committee of Port Chester and Rye residents has written to Port Chester Mayor Dennis Pilla and the Village Board of Trustees requesting major changes to the proposed Starwood Development project on the abandoned United Hospital property at Boston Post Road and High Street. As currently envisioned, the project includes over 1,050,000 square feet of commercial, retail, and residential space, plus 1,380 parking spaces. Despite the unseasonal heat and humidity, cool heads prevailed last night at the Port Chester Court House on Main Street. The tone of propriety was set when Mayor Pilla of Port Chester convened the public hearing, and all rose to give the Pledge of Allegiance. Dozens of Port Chester residents attended a Town Hall meeting Thursday, September 3, to learn from a panel of local experts how Starwood Capital’s proposed development of the United Hospital site could benefit the community if the wealthy developer provides funding for schools and affordable housing, and pays area standard wages for construction and maintenance jobs. Op-Ed: Will Port Chester Get a Fair Deal From Greenwich Developer? Starwood Capital Group is asking for a lot from Port Chester. The Greenwich-based private equity firm, which manages more than $44 billion in assets, wants the Village to rezone the former United Hospital to permit building a giant mixed-use development. Port Chester Residents Speak – Will Village Trustees Listen? The village of Port Chester crackled with energy last night, and most of it was being generated at the local Knights of Columbus, where there was a Town Hall meeting featuring the Sustainable Port Chester Alliance. They were there to raise concerns over Starwood Capital’s proposed United Hospital project, and further galvanize the citizens. Sixteen months after Starwood Capital Partners unveiled its latest plan for redevelopment of the former United Hospital site, the public got its first official opportunity environmental review process to comment on the proposal at a hearing before the Port Chester Board of Trustees. – Don Bosco Workers, Inc.